The installation was made by cutting into the building in a way that seems to reference Gordon Matta-Clark’s Conical Intersect (Building Cuts), but instead of forming a new viewpoint by discarding the cut away section, Wilson attached the circular cutout to a new motorised structure so that part of the external wall of the building rotated and turned itself around. I guess I could come up with all sorts of theories about how the work makes the viewer see the city space in a new way or challenges our preconceptions about architecture. But in the end the reason I wish I’d seen this piece is simply that it looks amazing and I think I’d probably have stared at it open mouthed for longer than is in any way reasonable. There aren’t many works that warrant the word awesome, but it seems appropriate here. This summer, in a reference to the final scene of The Italian Job, Wilson will be installing a coach hanging half over the roof-terrace of the De La Warr Pavilion in Bexhill on Sea. I’ve learnt my lesson: I’ll be heading down to the coast to see that one. 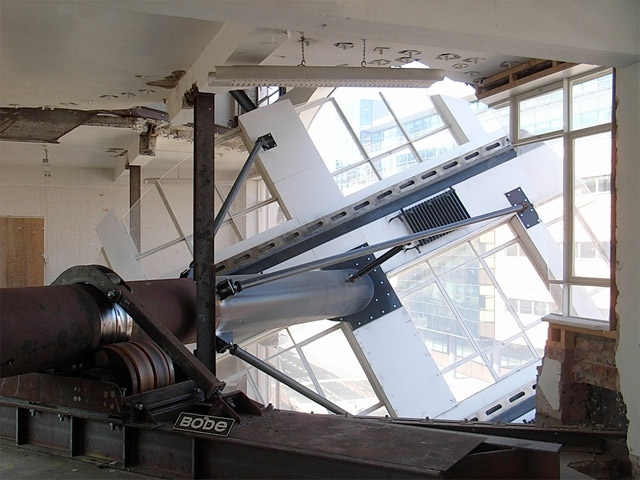 This entry was posted in Architecture, Installation, Intervention and tagged anarchitecture, architecture, art, installation, intervention, Liverpool Biennal, Richard Wilson, Turning the Place Over by Ann Jones. Bookmark the permalink.